By the end of 2009 we noticed Maya slowing down a bit in her everyday activities and the heart disease had progressed to moderate a bit more quickly than we hoped. An air of inevitability set in as I started sensing she didn’t have years left. She became a permanent fixture sleeping on our bed as I wanted her to have as much enjoyment as possible and that was heaven to her. In the winter she’d like to sleep under the sheets next to Jim and didn’t move all night long. By 2010 we certainly noticed that Maya wasn’t running the speed she used to, even at the lower jump height of 8,” but she wasn’t too far off in speed and still beat the other dogs in her class in AKC and USDAA. Some days she was still dynamite and beat dogs in the other classes too. By the middle of 2010 I could see she had less verve and stairs went from a moderate to slow trot or walk (she used to dash up the stairs in younger years). Dr Woodfield upped the blood pressure medication. Surprisingly as Maya got older she became more interactive with other people, cuddling up to a gentle guest at the house and even warming to those noisy children. Maya (facing the camera directly) is with Dinke and other pups. By January 2011 her heart disease had progressed just a bit further with resting respiratory rate constantly around the danger zone of 30 per minute and she started scaring us with occasional coughing fits. Dr Woodfield started her on the diuretic Furosemide, which increased her energy. 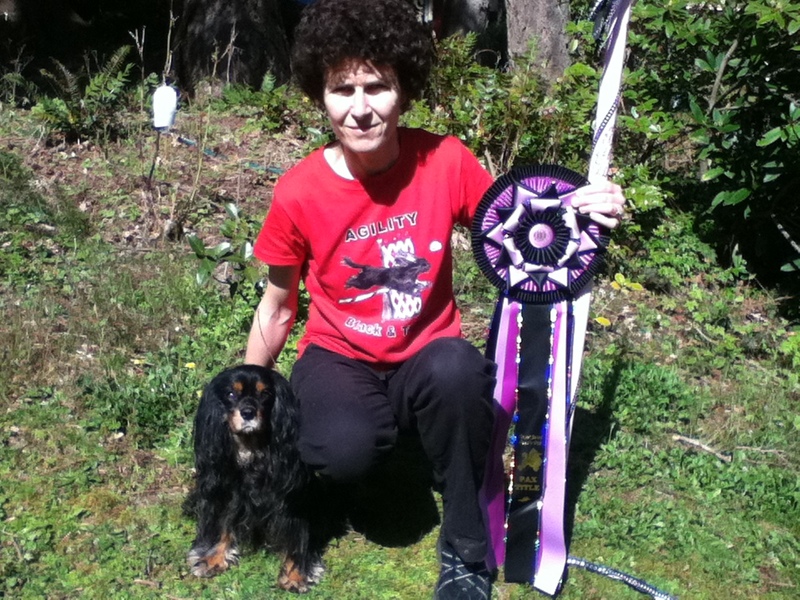 I decided that if we wanted to get a Performance Agility Championship title in agility now would be the time, so we entered a few more trials and completed our title in April 2011. Maya and me with her PACH bar. 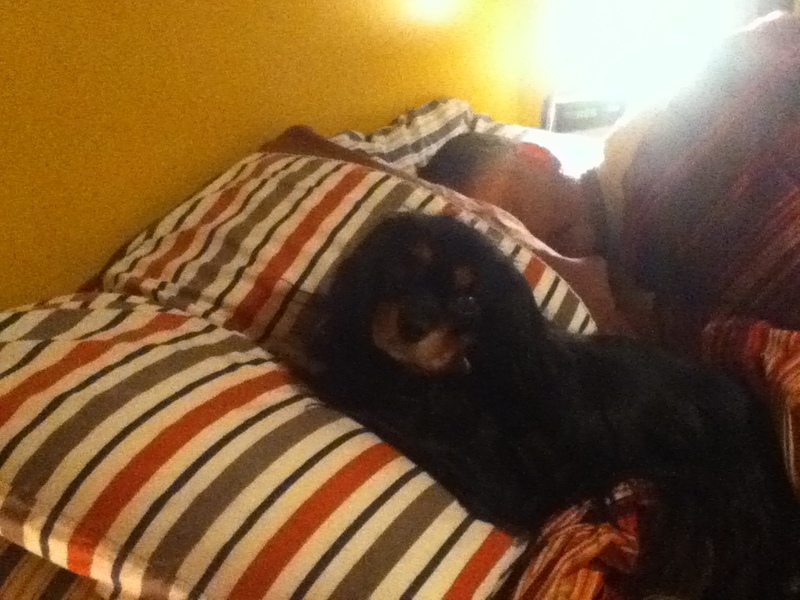 I'm also wearing a black and tan agility Cavalier tee-shirt with her image on it. The shirt was not created by me. Someone else found that image online and created the shirts. 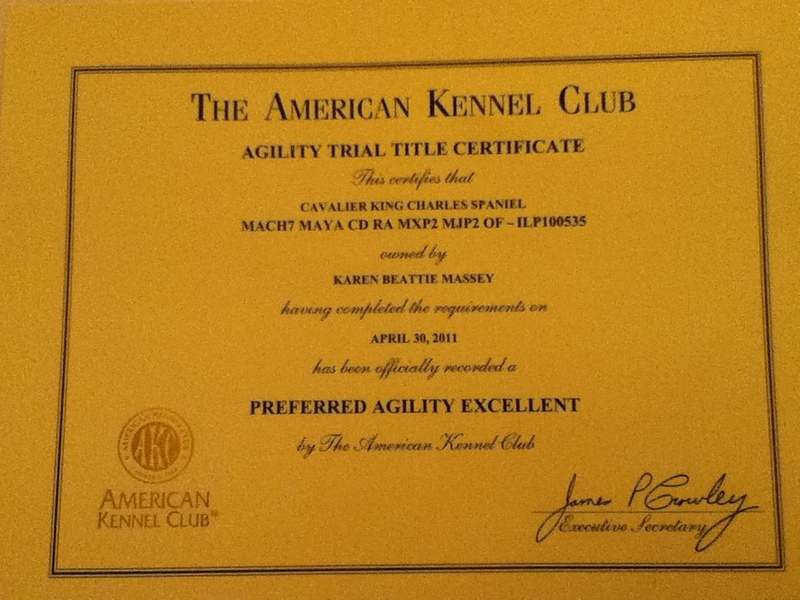 Maya's last AKC certificate for agility. 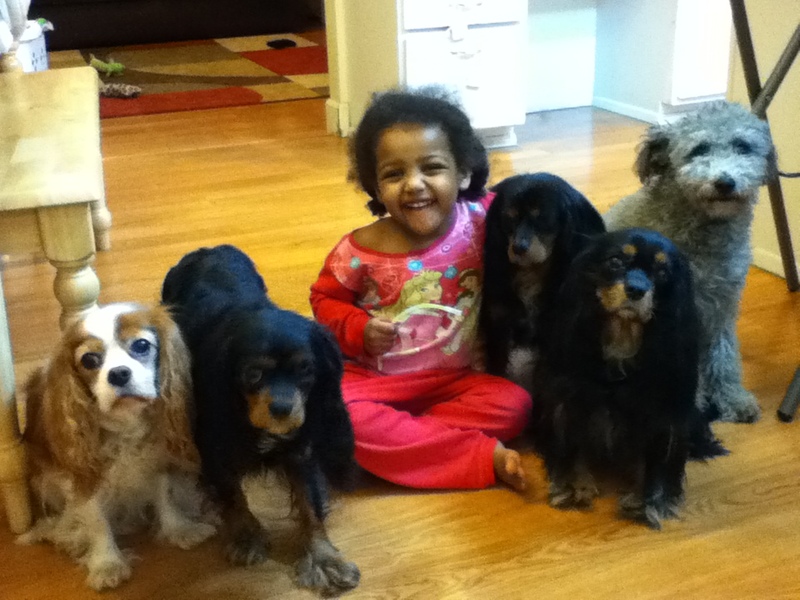 In May 2011 Maya went back to Dr Woodfield for another checkup, where more progression of the disease was seen and her medication increased again and Vetmedin added. Maya ran her last ever AKC trial in Sequim in June 2011. It was very hot for June so she just did the first run and had her rest in the cool car, even though she ran like the wind. Later in June I brought her to our local vet as she seemed especially fatigued with more frequent coughing and the x-ray showed pulmonary edema. 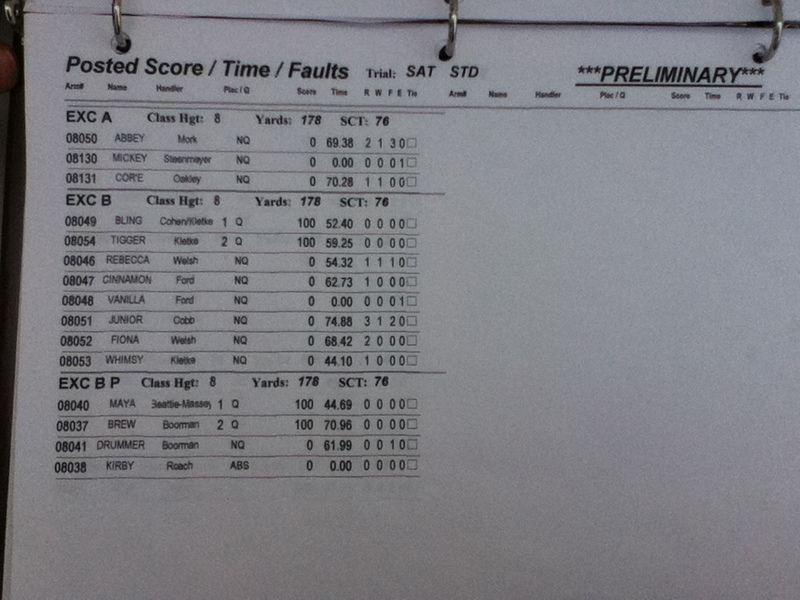 Results from Maya's last agility trial. She beat all dogs in the 8" and 12" classes that day. We seemed to bring the edema under control with increased Furosemide and Maya tried to do what was meant to be her retirement run in USDAA in early July. I could tell after the first few jumps she was having trouble maintaining speed and then she stopped on top of the A-Frame and gasped for air. I pulled her straight off the course and decided we’d enjoy full retirement after that. By early August we were finding her energy level varied day to day and sometimes her breathing was quite labored. One night her breathing was very labored and she was very restless. This was not completely unexpected as she’d grown increasingly uncomfortable at night over the last few months, often shifting many times during the night. Also in the evenings when we all usually relaxed together she found it uncomfortable sitting on the couch and went off to find a cool piece of floor by herself. By this time it had been years since she wanted to sit in someone’s lap. In the morning she seemed a little better but by the time we got home from work Maya was breathing at about 70 breaths per minute. Her walking was slow and weak and I knew we had to go the emergency vet. I had hoped through careful management of medication we’d be able to keep her comfortable despite progressive and irreversible heart damage and that no “heroic measures” would be needed. However, when I saw how much better Maya was on oxygen we proceeded with the intravenous Furosemide. Two mornings after the incident she was ready to come home, much weaker than before but with increased verve and spirit as if she knew there was another chance. I realized that in my efficiency to get the weekly pills and supplements measured out that I’d forgotten to include the Furosemide for the 2.5 days leading up to the emergency. Apart from feeling rotten about my mistake it also made us feel that there was hope with increased meds and Spirnolactone was added to the mix. 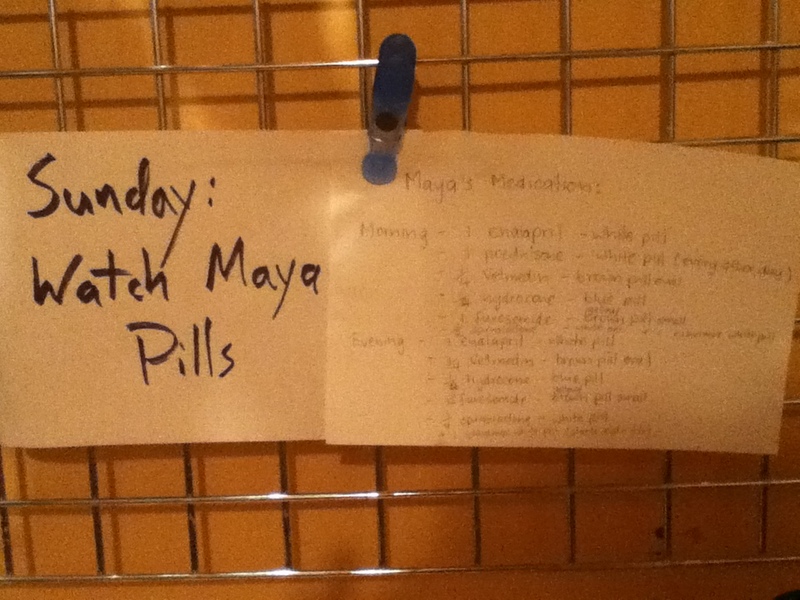 Maya's medication list documented for everyone in the family to make sure we had it correct. A real cough set in this time with the extreme heart enlargement and pressure on the trachea but Maya couldn’t cough as hard as before. We added Hydrocone for the cough but I’m not sure it ever made too much difference. And to my mind her breathing never really returned to its pre-emergency state. In the last 6 weeks with increased medication Maya enjoyed wandering in the garden occasionally and wanted to be more interactive than before, although as Dr Woodfield warned the brief summer heat caused fatigue. She battled a urinary infection and struggled with stabilizing her breathing such that we successively upped her diuretics, but still managed to maintain them on a twice daily schedule. I worried constantly about her breathing and brought her into work when it seemed bad to make sure I’d be there if she started suffering. Maya resting in bed in mid-August 2011. Sometimes she let me get a spot too. We had stopped the Prednisone after the emergency but had to reintroduce it as she was being driven crazy with scratching. The Prednisone also seemed to help the coughing after the initial bad morning burst but I’m sure wasn’t helping her heart. She also became very demanding barking at the fridge for treats and wanting to get involved in puppy tussles just like the old days, which made her cough and gag. I even caught her chasing a bird and then lunging and barking at the other dogs coming in from the potty spot to show them who was boss, just like the old days, except it wasn’t the old days anymore. In the last 2 weeks I was in contact with our vet Dr Rice or at the vet several times culminating with a visit to confirm the pulmonary edema I was hearing. We decided the diuretics needed to go up to 3 times a day so I brought Maya back to work. Between that last visit and the next morning we had given her another 20 mg of Furosemide making the 4th dose that day to try and dry everything out, but she continued to struggle and wheeze with every breath. When Maya screamed in pain the following morning along with her regular coughing fit, Jim and I felt we had reached the end of our capabilities to keep Maya comfortable at home. Faced with another visit to hospital, time in an oxygen chamber, an opinion from Dr Woodfield that it may not help, and medication that no longer seemed to help enough we made the difficult decision to say goodbye on September 16, 2011. Maya was 9 years and 2.5 months old. Thankfully the end was very peaceful for all of us. Maya happily munched on cheese. Her fur was really soft and fragrant as we’d washed her the night before, not expecting this to be the day. She looked so gentle and beautiful as we walked out the door wanting to keep the memory of how she looked forever in our minds. 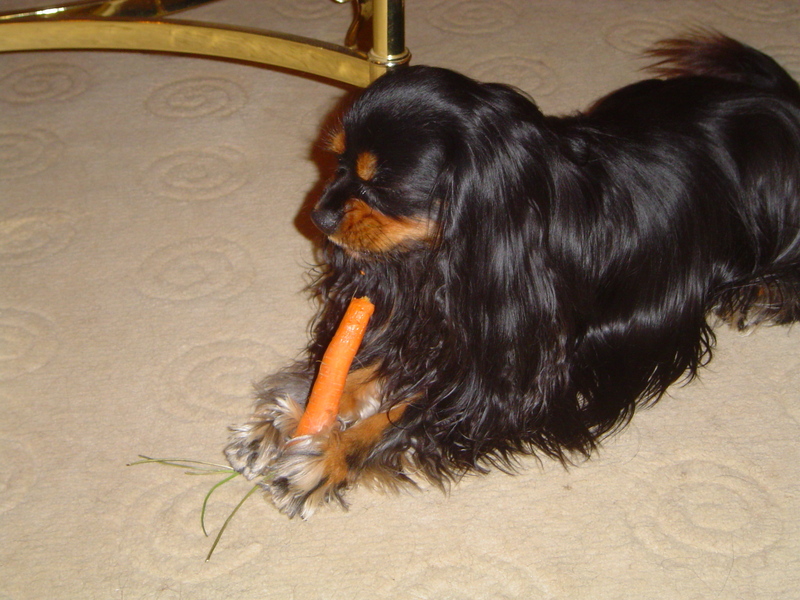 A photo of Maya from 2006 with her favorite chew treat that she enjoyed her whole life. This photo shows her wonderful soft coat.